Abhirup Das Barman received the bachelors degree (B.Tech) in Electronics & Communication Engineering (ECE) from the Institute of Radio Physics & Electronics (IRPE), Calcutta Univ. and master degree (M.Tech.) in Electrical Engineering (EE) from IIT Kanpur and Ph.d from IRPE, Calcutta Univ. 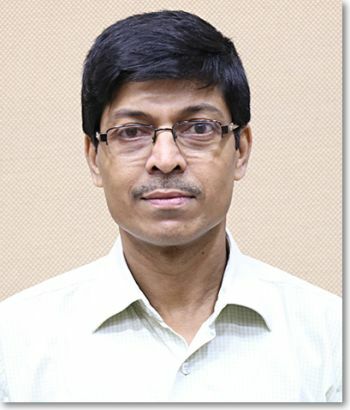 He worked few years in Indian Broadcasting Engineering Service (IES), Government of India in the areas of Satellite Communications, Digital Terrestrial Transmission (DTT), etc. Then he joined as a faculty in the Dept. of Radio Physics & Electronics, Univ. of Calcutta. Presently he is a Professor in this Department. In 2007 and 2009 he worked as a visiting researcher at the CNIT Photonic Networks National Laboratory, Pisa, Italy. In 2010-11 he worked as a researcher in Aalborg University, Denmark in the Dept. of Electronic Systems. In 2015 he worked as a visiting researcher at Limerick University Ireland, Dept. of Computer Science and Engineering. 1) Senjuti Khanra, Ipsita Sengupta and A. Das Barman, “Small and Large Signal Analysis using Circuit Model of InGaAs/InP based Uni-Travel Carrier Photodiode", Journal of Opt Quant Electron, Springer, 49:374. PP. 1-24 (Oct., 2017). 3) Karar, S. and Barman, A.D., “ Opportunistic spectrum access for cooperative unlicensed femtocells in two-tier heterogeneous networks utilizing HARQ feedback”. Computer Networks, Elsivier 123, pp.64-76, 2017. 5) S. Karar, S. Ghosh, A. Das Barman, “Promoting femtocell cooperation through incentive for improving data rate of indoor users in underlay heterogeneous network", in IET Communications, 10(17), pp. 2407 – 2415, Aug. 2016. 6) Rangana Banerjee Chaudhuri, A. Das Barman, S.Bhanja, A. Majumder and S.Kar, “Low Phase Noise Frequency Tripled Microwave Signal Generation Using External Optical Modulation” Microwave and Optical Technology Letter, 2016. 7) S. Karar, A. Das Barman, "Opportunistic Sub-channel and Transmit Power Allocation in an OFDMA Based Cognitive Femtocell Network", in Wireless Personal Communication, Springer, 2015, 84(2), pp.1303-1323. 8)Senjuti Khanra and A. Das Barman, “Photo Response Characteristics from Computationally efficient Dynamic Model of Unitravel carrier Photodiode”, Journal of Optical and Quantum Electronics, Springer, Springer. vo. 48, no. 2, pp. 1-11, Dec 2015. 9) Alak Halder and A. Das Barman,” Improved Performance of Colour Shift Keying using Voronoi Segmentation for Indoor Communication”, Journal of Optical and Quantum Electronics, Springer, Pages1407-141, June 2015. 12) I. Sengupta and A. Das Barman, “Investigation of inter-channel crosstalk mitigation by assist light in a TOAD switch by using electrical equivalent circuit model of SOA”, Journal of Optical and Quantum Electronics, Springer, Jan. 2014. 13) I. Sengupta and A. Das Barman,“Analysis of optical re-modulation by multistage modeling of RSOA”, Optik, Elsevier, Optik 125, pp. 3393–3400 February, 2014. 14) I. Sengupta and A. Das Barman and P. K. Basu, “Circuit model for analysis of SOA-based photonic switch”, Journal of Optical and Quantum Electronics, Springer, vol. 41, no. 11, pp. 837-847, June, 2010. 17) A. Malacarnie, Jing Wang, Y. Zhang, Abhirup Das Barman, G. Berrettini, L. Potì, and A. Bogoni, “20 ps-Transition Time All-Optical SOA-based Flip-Flop used for Photonic 10 Gb/s Switching Operation without any Bit Loss”, IEEE Journal of Selected Topics in Quantum Electronics, Vol.14, N0-3, June 2008, pp. 808-815. 18) Abhirup Das Barman, and P. K. Basu, “Incoherent In-band Crosstalk Induced Power Penalty in Amplified Wavelength Division Multiplexed Networks: a Comparative Study using Gaussian and Chi-squared Probability Distribution Functions”, Journal IET, Circuits, Devices and Syst., 2008, UK, 2, (1), pp.139-143.